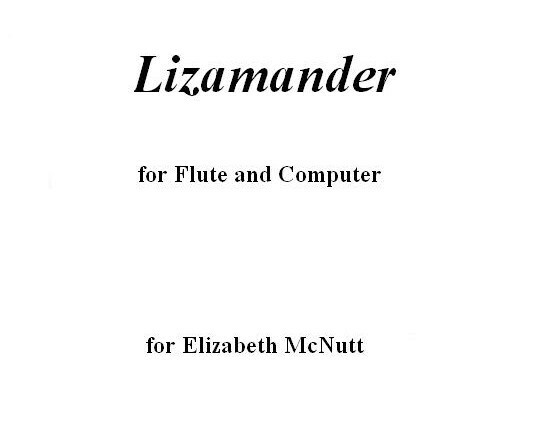 Lizamander was written for Elizabeth McNutt. It is the second in a series of works for solo instruments and Max/MSP, the first of which was called Gerrymander, written for the clarinetist, F. Gerard Errante. The focus of both of these works is on interactivity and live audio processing. The computer captures material played by the solo instrument during the performance and uses that material (as well as some pre-recorded sounds) to generate a syncopated rhythmic accompaniment, while adding various effects to the sound of the flute. Since the computer is constantly “listening” to the flute, the tempo is somewhat flexible, which allows the performer considerable interpretive freedom. Lizamander relies heavily on pitch tracking throughout the piece, not only for score following, but also for sample triggering, contrapuntal harmonization, and other “intelligent” effects. It relies even more heavily (as does Gerrymander) on having an extraordinary performer! Included on the CD Music from SEAMUS volume 14, featuring Elizabeth McNutt. Also commercially recorded by Lindsey Goodman on the Pittsburgh New Music Ensemble CD Against the Emptiness, NCU Dynamic Records.